Rock Candy Mountain Issue #8 hits stores February 7. 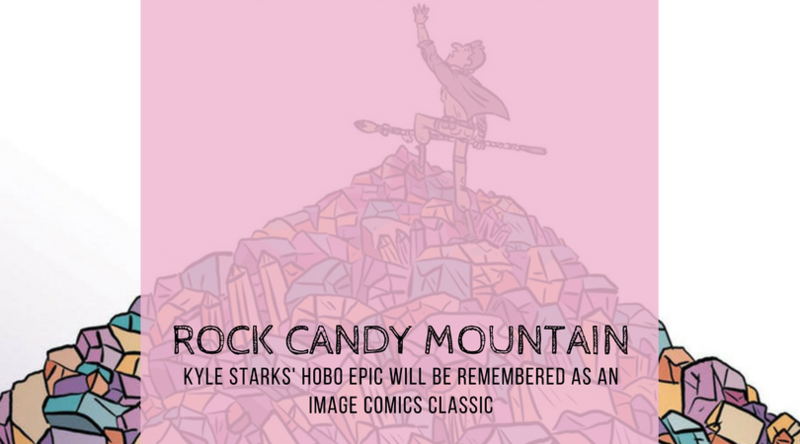 The last time we saw Jackson of Kyle Starks’ Rock Candy Mountain, he was about to have the fight of his life — with the man who bought his soul in exchange for the promise that Jackson couldn’t lose a fight to “any one man”. The 8th and final issue of this hobo epic picks up right where issue #7 left off, and keeps the momentum going without dropping a single beat. Rock Candy Mountain issue #8 is a fitting end to this series, which follows Jackson as he runs from all manner of people, including FBI agents, rival hobos, and the Devil himself. He’s running toward Big Rock Candy Mountain, supposedly a hobo’s paradise. But he isn’t hoping to find a sunny land of cops with wooden legs and dogs with rubber teeth — and it isn’t certain whether he’ll make it there at all. That question is answered in the final issue of this series, which features an epic, long-coming fight, as well as the beginning of a new journey for nearly every character. Jackson may be the protagonist of this book, but he certainly isn’t the only one whose future has been held in a delicate balance throughout Starks’ story. Throughout the course of Rock Candy Mountain, Starks has accomplished quite a lot. He’s established a mythos specific to his protagonist, including involvement with the devil, a religious object of incredible power, and a collection of friends who each have their own seemingly divine skills. He’s created a comic book that revolves entirely around hobos living in World War II (something colorist Chris Schweizer apparently told him was a mistake, because the Great Depression is known as “the golden age of hobos”, but Starks insisted that the setting was plot-relevant — which, of course, it is). Starks has also — somehow — taken a “jokey fight book” (his words, from an interview I did with him last year) and transformed it into an emotional journey featuring a war-hardened “hero” who’s desperate to make it back to his family. Jackson’s “Big Rock Candy Mountain” is the Heaven in which he gets to see them again. In order to get there, he has to rely on his own instincts as well as the help of folks he both expects to need and doesn’t expect to care about at all. Listen. I know how silly it sounds to pinion a “hobo epic” as one of the best comics of the last year. I know. And I know how problematic it is to argue that this series — which fridges two women (Jackson’s wife and daughter) in order to kick off his story — is worth not only your time, but your money and your recommendation. I know. But Rock Candy Mountain is one of the best comics I’ve read in quite some time, and it’s definitely, definitely worth your attention. Starks steeps this story with history, including real-life villains who are defeated without question by Jackson and his friends, like Hundred Cat — “the world’s youngest African American streetfighter/cat burglar.” The hobo ethical code (created by the Tourist Union #63 at the 1889 National Hobo Convention in St. Louis) is an important tenet of the story, as is the fact that hobos — though commonly mistaken for homeless vagrants — were migrant workers who relied primarily on train transit to get from job to job. Each issue of Rock Candy Mountain edges closer to the natural conclusion of its finale, all while keeping your interest and crafting important narratives for each character in the ‘verse. Starks’ writing stays consistent throughout, as does his art, and Chris Schweizer’s colors expand with the story to make each element pop. Issue #8 features some full-page panels that are truly stunning. The emotional impact of each is so significant that I couldn’t help but just stare for a little while, totally enamored. This finale moves quickly, but Starks doesn’t pull any punches. By the end, you’re as desperate as Jackson, and the emotional payoff is 100 percent worth the investment. 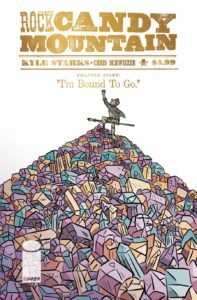 Rock Candy Mountain Issue #8: “I’m Bound to Go.” is the second of a two-part series finale. It hits comic shops February 7. You can order issues online through the author or through Image Comics. In Full Bleed received an advanced copy PDF of the issue from Image Comics for review purposes.